Sally Slapcabbage is a 50ft cruiser stern Colecraft 1996. In case you were wondering, this lovely boat is named in honour of the owners maternal grandmother. Sally Slapcabbage was her imaginery childhood friend, responsible for any mischief that occurred! She started her life in 1996 and from 2007 to 2012 was part of the Kate Boat hire fleet before returning to the custody of the current owner. She is in splendid condition and has been really well looked after. Steps from the spacious well deck lead into the centrally heated saloon with the fabulous panoramic windows which reach over 6’ in width at their widest point. The L shaped dinette, which converts into a double berth, has the option of a single or double demountable table. Into the galley which houses a houdini hatch, ample storage space, including a floor to ceiling cupboard, a 4 burner gas hob, oven & grill and the fridge. The corridor leads to the bathroom which has a screened shower over the 4’ bath and a ceramic basin over vanity unit. The loo is a ‘dump through’ pumpout. These are very practical as there is nothing that can go wrong or get blocked. The fixed 6’x4’ double bedroom has plenty of storage and the unusual benefit of a hand wash basin. 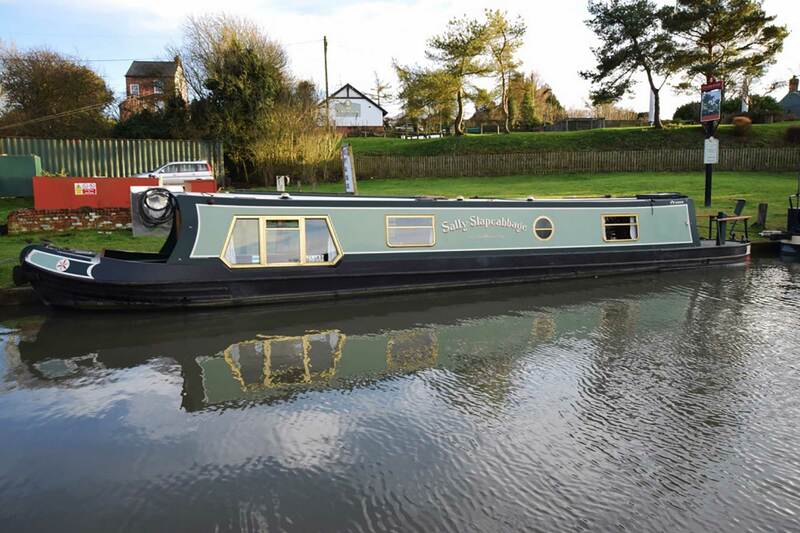 The stern deck is a sociable one at 6’6” with comfortable bench seats around the stern rails. The quiet Beta Marine is easily accessible under the stern deck. Sally Slapcabbage is a 50ft cruiser stern Colecraft 1996 and a charming boat.